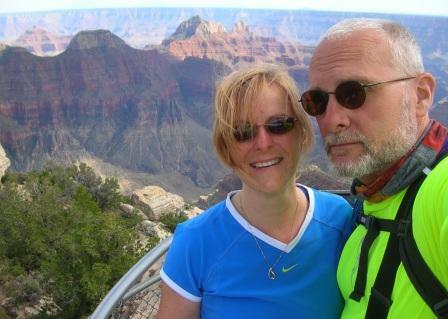 June 12, 2008: After leaving San Diego for the ride home to Washington, we decide to loop north to escape the heat and stop for a while at the North Rim of the Grand Canyon, which Linda has never seen. It’s a clear day, giving beautiful views of the canyon. We end up staying too long, and I know we’ll be riding in the dark soon. As the light fades, we ride north on U.S. 89 and inquire about motel rooms. But the prices are outrageous, and I decide to push on. It gets darker and chilly and we realize motels are few. We stop at a gas station in Long Valley Junction, Utah, to fuel up and put on more layers. Under the pump lights, I study the Utah map. Looks like it’s best to take State Route 14 to Cedar City and I-15, with more motels. If we stay on 89, we’ll be riding all night. The station is closing, the employees clearing out. One stops and asks where we’re from and where we’re going; Linda tells him and says we’re going to Cedar City. Ah, jeez, I think to myself. Deer are unpredictable and dangerous, especially in the dark. I’ve heard way too many stories; just one can take down a motorcycle. Usually they jump out in front of you. 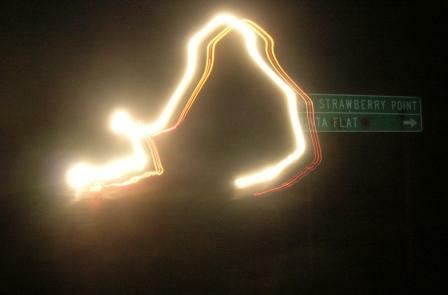 14 is a rural road and almost pitch black and we’ll be on it for about 40 miles before we reach Cedar City. “I’ll be careful,” I tell Linda as we saddle up. I’ve upgraded the stock bulbs on the BMW to high-output halogens and added a set of PIAA 510 lights, one on each side. 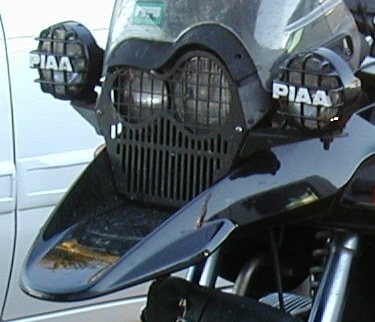 They’re like a pair of small spotlights, but fairly powerful. We start off and I switch on the high beam and the 510s, using every light I’ve got. The road is two-lane asphalt with gravel on the sides and it quickly turns curvy, wandering in and around hills. I keep our speed down to about 20 mph, the lights fade behind us, darkness moves closer and I start living in the tunnel of light ahead. I’ve put more than 70,000 miles on this bike and I trust her. We’re solid together. We should be okay…then I see a deer ahead, no, two, standing by the side of the road watching us as I throttle down and pass them. “Did you see that?” I yell back to Linda. “Yes, two!” she yells, and we’re yelling not only over the engine noise and the full-face helmets but because I’m wearing standard earplugs, which help lessen fatigue on long rides. It’s tough to carry on a conversation, though. I tell myself we’ll see more and sure enough, brown bodies and bright eyes start appearing on the hillsides and up the road, startled by our running lights. I back off the throttle and count…3,4,5, wait, two more…Jesus! There’s about a dozen. More up ahead. We’re in a herd! The road twists, turns and straightens for a bit; we’re moving at about 10 mph, passing deer left and right until I catch movement out of the corner of my eye and turn my head to the left and see a large buck galloping alongside us, getting closer. My heart stops and I twist the throttle and the bike surges ahead and away from him. This is too much, I tell myself, and I realize I’ve left the grille covers on the 510s, which cut down the light they cast. I know I’ll have to stop and remove them. No other way. Trouble is, there’s no place to stop without being in the road and though we’ve seen no cars, I don’t want to stop on this road in this black night. But then I see the asphalt widen a bit, a junction with a gravel road. This will have to do. It’ll just take a second, we’ll stop, pull the covers, stow them in a side case, remount, and get the hell out of here. I stop the bike as far to the right as I can, without straying into slippery gravel. Linda gets off, says, “What’s wrong?” and I say I have to pull the covers, I need more light. I shut off the engine, hit the four-way flashers, and get off to lift the bike onto her centerstand. But something’s wrong, Linda’s gasping, “We’re too close to the edge,” and the bike loses her keel and tilts away from me and I can’t hold it and she crashes into the gravel. I cuss mightily and try to get her up. Linda helps and we finally get her upright. Linda steadies her as I keep a deathgrip on the handlebars and move around to make sure the sidestand is down and get the bike set. I can hardly hear him through the helmet and earplugs. “WE’RE FINE!” I say, trying not to yell but probably yelling anyway. And I realize how ridiculous this is; we’re standing in the dark, on the side of the road, and I can’t see or hear anything. The driver leaves and I attack the 510 covers and find I can’t get them off. I remember they were loose before and my father and I worked on them in his garage back home in Cleveland; he added an ingenious extra washer which made them fit just right, but harder to remove until I discover how to do it. I stow the covers and look around for Linda. She’s taking pictures. I yell for her to get on the bike and finally we’re moving again. The uncovered 510s give us better light for the rest of the ride, but we find we’re past most of the deer, only a handful by the side of the road. I’m tensed up and I stay that way until we finally reach the lights of Cedar City. We stop at the first decent motel and I’m too tired, too wrung out, to care about the price.